Before dawn (Oct 4/5th 2007) I made my 2nd visual observation of C/2007 F1 LONEOS within 12 hours. In the pre dawn sky it was well placed in the NE within Melotte 111 in Coma Berenices. I observed it from 05.30 - 06.08 BST with the 8.5" F/7 reflector. I noticed that the pre dawn period is much more favorable than the corresponding evening apparition with the comet clearing rooftops at the beginning of the session greater than 10 degrees in latitude. 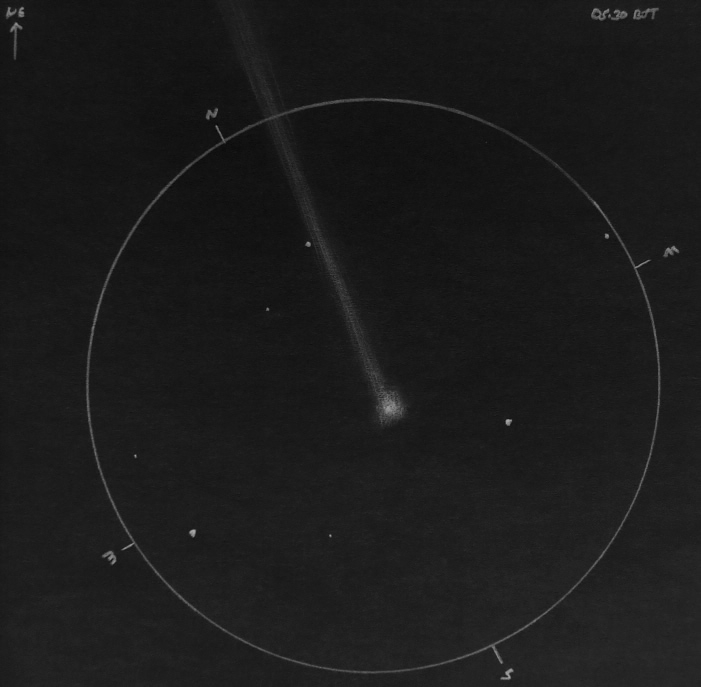 By the end of session the comet was between 15 - 20 degrees high. For much of the session it was visible in a dark sky! Coma was grey-green with white central region sporting a vivid stellar false nucleus. Coma is compact and well condensed. I also made my first observation of a blue plasma tail extending for no less than 1 degree to the north even in light haze. At one stage I suspected the tail was greater than 2 degrees long however I cannot confirm this. Comet is looking very healthy! Mag: + 7.5, D.C:6, Dia: 4' - not seen in 10x50s.